Meet Senator Donna Campbell, M.D. 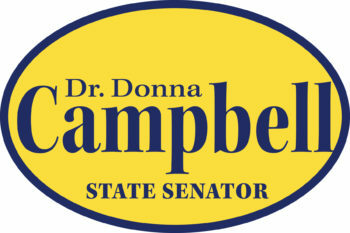 Senator Donna Campbell, M.D. is a board certified emergency room physician and proud parent of four daughters. She lives in New Braunfels and represents Senate District 25, a six county district which includes parts of San Antonio and Austin. She currently serves as the Chair of the Senate Veteran Affairs and Border Security Committee. Senator Campbell was born on a naval base and grew up with a great respect for the military and law enforcement. Her father served in the U.S. Navy and later as a trooper in the highway patrol. Her mother worked in factories most of her life until studying to become a nurse at the age of 48. Senator Campbell completed her Masters of Nursing from Texas Woman’s University and received her M.D. from Texas Tech University, where she was a member of Alpha Omega Alpha, the honor society for medical schools. She completed her residency at the University of Texas Health Science Center in Houston and was awarded the prestigious Morton Award as an outstanding resident in ophthalmology. Senator Campbell has received top honors for her legislative accomplishments from the NRA, Texas Alliance for Life, Texas Values, and the Texas Veterans Commission. She has been recognized as a Top Courageous Conservative three times in a row by the Texas Conservative Coalition and designated as a Fighter for Free Enterprise by the Texas Association of Business. During the 85th Legislature, Senator Campbell authored and successfully passed 53 bills to the Governor’s desk on their way to becoming law. She sits on the Finance, Education, Business & Commerce, and Intergovernmental Relations committees and was most recently appointed to chair the Select Committee on Aging, which studies issues that affect Texas’ senior citizens. A proud woman of faith, Senator Campbell has volunteered with Christian Eye Ministries and performed hundreds of eye surgeries in the West African nation of Ghana. In her spare time, she is an avid hiker, skier, and runner. In 2012, she became just the fifteenth woman ever elected to serve in the Texas Senate.